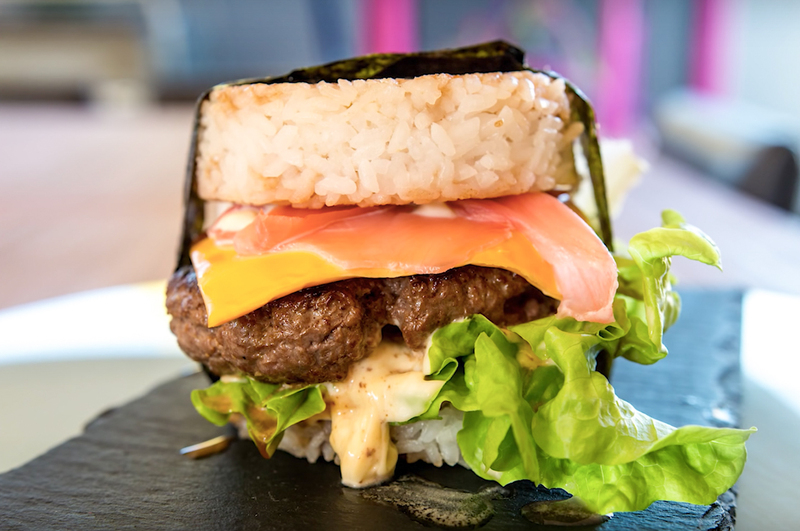 East meets West with a Sushi Burger Fusion. I made this on the last live show and it was so good. So here is the recipe for you to try at home.Go on you know you want to. Firstly you will need to cook your rice. Place the rice into a pan and cover with running water. Massage the rice gently between your fingertips and then tip out the water. Repeat a couple more times till the water starts to run clear. Drain as much of the water as you can and then add 2 cups of fresh water and a pinch of salt. Take over to the stove and bring up to a boil so the water is just boiling on the edges and the rice is starting to dance. Lower the heat right down to it’s lowest flame heat and cover the pot with a towel. Pop on the lid firmly and fold in the edges of your towel so it doesn’t catch alight and burn. Set a timer for exactly 10 minutes and leave to cook. After 10 minutes remove from the heat until you are ready to use. Next you can season your beef. In a large bowl add the meat, wasabi, pepper and soy sauce and mix together until the seasonings are thoroughly combined. I used a food ring to press out my beef patties but this can be done by hand. Divide the meat into 4 equal portions and form into 4-4.5inch patties. Set aside in the fridge to chill. Next uncover your rice and gently fluff up. Add the rice flour and stir through carefully. Tip the rice out onto a flat surface to cool. When it is cool to touch take 3 dessert spoonfuls of the rice and place into the food rings. Compress down fairly firmly to make the base of your burger bun. To make the tops use 4 spoonfuls of rice. Repeat this process until you have 4 tops and 4 bottoms of your buns. Mix the soy sauce and sesame oil together in a small bowl and brush over the bases of your rice buns. In a thick bottomed skillet add some rice bran oil and heat til hot. Place you bases, seasoned side down, into the pan and brush the top side with more soy and sesame. Add the bun tops and cook on both sides until brown and crispy. Remove from the pan and now you can cook your burger patties until they are cooked the way you like them. Now its time to construct our Sushi Burgers. Take a strip of nori and lay on a board. Place the bace bun on top of the Nori. Add some lettuce, squeeze out some kewpie, place on the burger patty, a touch of wasabi if you like it, layer next the cheese and then the delicious pickled ginger and lastly the burger bun top. Wrap the nori strip around the burger and seal with a little water. 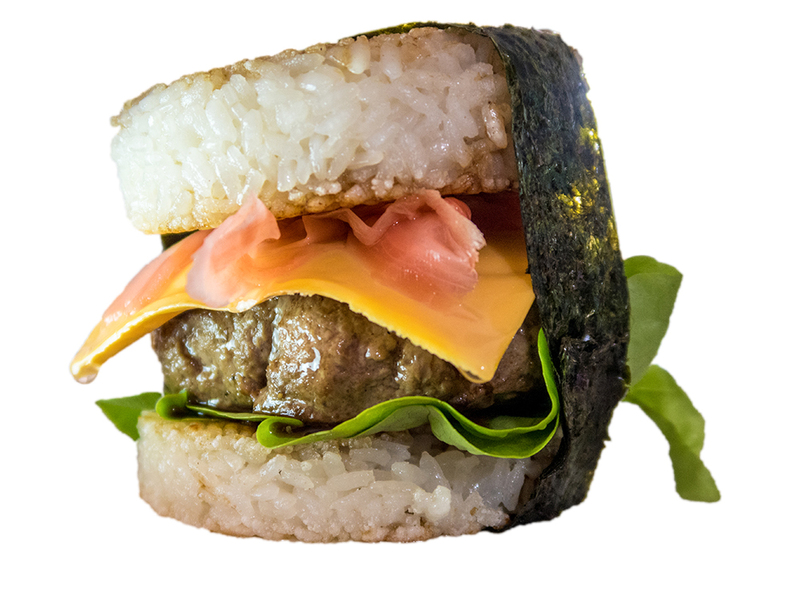 You Sushi Burger is ready to be enjoyed. You can just pick it up to eat it but it might be a little easier to eat with a knife and fork.